The Kansas Emporia 12 in. x 12 in. x 10 mm Polished Marble Floor and Wall Mosaic Tile will provide endless design possibilities from contemporary to classic. It creates a great focal point to suit a variety of settings. The mesh backing not only simplifies installation, it also allows the tiles to be separated which adds to their design flexibility. The tiles are finished with a cracked joint look. The natural material will have a color variation. Due to the nature of stone, variations in color and veining may occur. This is the natural beauty of the product. 1 square feet per piece, each piece sold individually, piece weight equals 5 lbs. Buy online Splashback Tile Kansas Emporia 12 in. x 12 in. 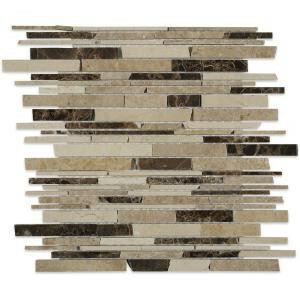 x 10 mm Polished Marble Mosaic Tile HD-EMPRIA, leave review and share Your friends.